Butter Chicken is decadently rich, yet balanced. A creamy, flavorful sauce melds perfectly with tender, flavorful, fire-roasted chicken. In the world of culinary arts, the incomparable North-Indian butter chicken (murgh makhani) stands alone. Decadently rich and flavorful but balanced, this dish is so very satisfying, yet it leaves one wanting more. A creamy, vibrantly orange, and spice-filled sauce perfectly complements tender, flavorful, fire-roasted chicken. Without a doubt, authentic butter chicken will make you feel like royalty. One has not lived unless you have eaten murgh makhani. Butter chicken is best prepared over coals. A gas grill will make a fine substitute, but stewed chicken will simply not compare. 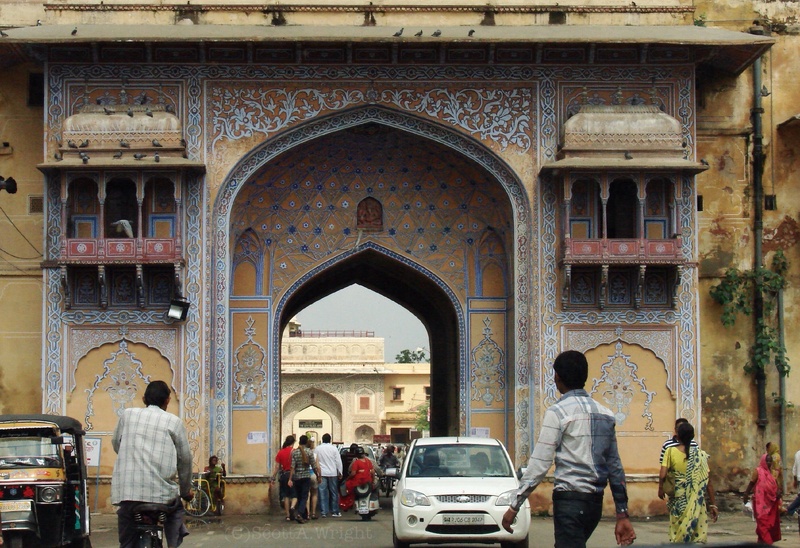 It was my very good fortune to tour the Golden Triangle in India in the summer of 2013. Looking for cultural experiences, I took an amazing cooking class with Chef Lokesh Mathur in the incredible city of Jaipur. This version of butter chicken is based on the dish made with Chef Lokesh, but as cooks are want to do, I’ve adapted and modified some details, creating my own version. Yes, butter chicken does take a little extra time and requires some ingredients not usually found in typical Western kitchens. And yes, the amount of butter and cream in this luxurious dish may be off-putting to some. However, murgh makhani is a special dish best served without skimping on ingredients or details. For about $10-$15 and a trip to the local import market, you can purchase some wonderful ingredients for countless future flavorful dishes, AND have a culturally enriching experience. 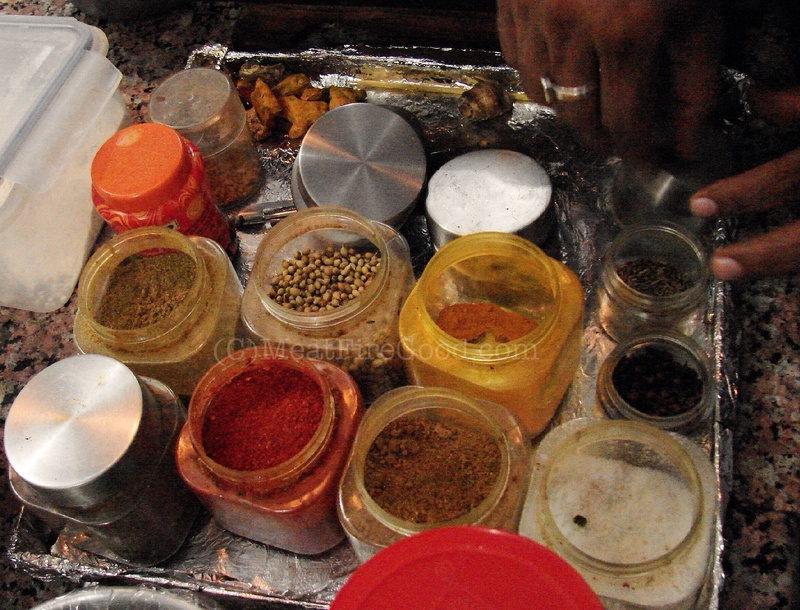 Chef Lokesh Mathur’s spice tray, at his Jaipur Cooking Class, India. Preparation of butter chicken is fairly strait forward, but let’s cover a few details that will set you on the path to an authentic and perfect dish. It is easy for the uninitiated to be overwhelmed by the many (and often new) ingredients found in Indian cuisine — some of them with multiple names due to the many languages in India (23 official!) and their differing English names. However, let me guide you through it — it is completely manageable and so worth the effort. 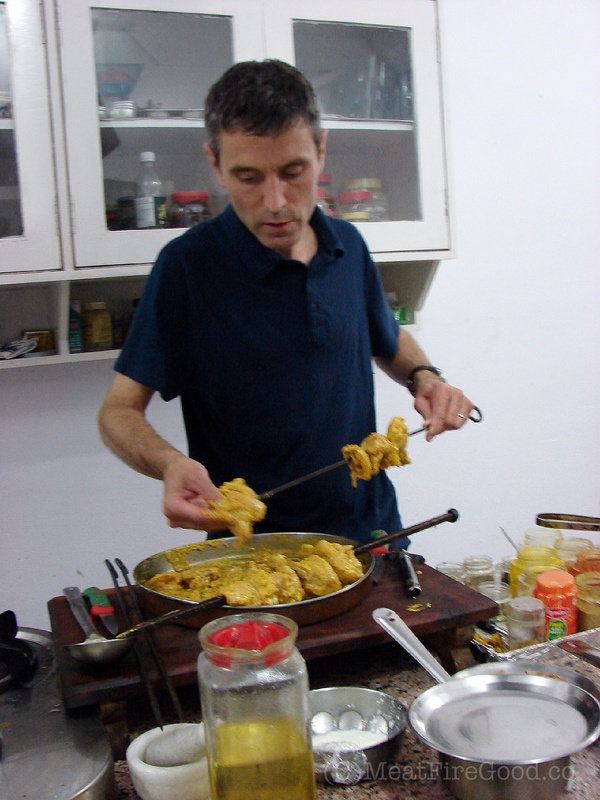 My cooking will forever be better for having learned some key Indian ingredients and techniques — some from Chef Lokesh, some from my own culinary explorations. Garam masala is a blend of spices that is frequently used for a variety of meat dishes. It is essential for this dish. One can make it, but a small amount is easily purchased at an import market for very little cost. If you don’t keep ground turmeric in your spice cabinet, well, you should! Turmeric is bright orange, loaded in anti-oxidants, and imparts a mellow earthiness that I have difficultly describing. It is used as a base in a great number of curries. It is a must-have. Ground coriander, the seed of the cilantro plant, is loaded in flavor and found in a wide range of cuisines such as Mexican dishes (incidentally, Indians refer to cilantro as fresh coriander). Like Turmeric, ground coriander is essential to butter chicken, and useful in so many other dishes. Gram flour is flour made from a type of lentil. Westerners tend to use one or two types of flour; regular white flour to thicken this recipe’s marinade would be fine. However, Indians used a variety of flours in their cooking. Gram flour has a bean flavor that is very different from wheat flour, but I don’t think the flavor is essential for this dish in the small quantity used. Roasting ingredients for Garam Masala. Curry leaf is a very flavorful shrub leaf that adds aroma and spice without adding heat. This addition makes for a distinctive butter Chicken, setting it apart from others. My package of curry leaf cost $1.25 and it will add priceless flavor to dishes for a long time to come; it is the best buck-twenty-five I’ve ever spent. Fenugreek (kasoori methi in Hindi) is found in many curries throughout India. Once roasted, its sweet aroma imparts a finishing note that is simply divine. This is a traditional ingredient and I suggest you do not omit it. I made a Cashew paste quite simply from a small can of lightly salted cashews by dicing and grinding/mashing. Added to the sauces, cashew paste contributes to the texture, the creaminess, and of course, imparts a light nuttiness to the dish. One could leave it out, but the best recipes include a nut paste. If you are going to test the water, I say take the plunge and add cashews. Besides, you will have nuts left over to snack on. Lastly, garlic-ginger paste is integral to this dish and easily made ahead of time from the garlic and ginger sitting on your windowsill. I use Chef Lokesh’s mix – simply combine peeled and diced garlic with peeled and diced ginger in a ratio of 2:1 in a small food processor. Blend thoroughly with a little water until reaching a paste consistency. Make loads of this flavor-bomb and freeze small portions in zip-lock bags. Your tastebuds will thank you. Again, this is a must-have for butter chicken. 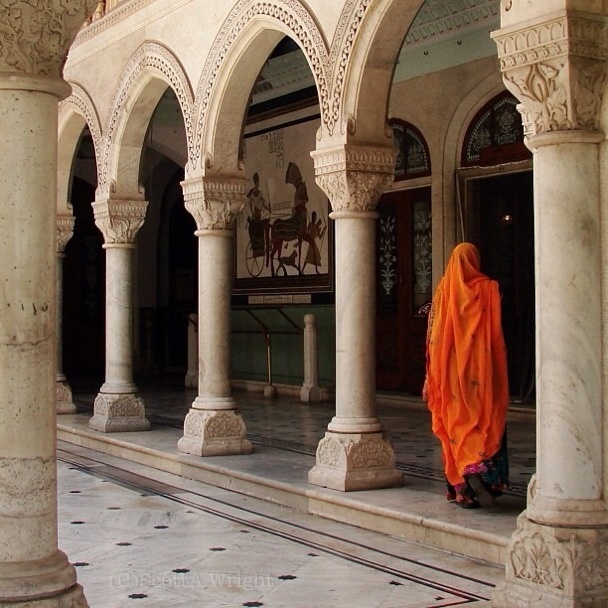 A colorfully veiled woman walks through a courtyard in the city of Jaipur, India. My philosophy is that if you are going to make the effort to make an amazing dish like butter chicken, one should make a lot of it so there are leftovers or enough to freeze for a future date. This plan went awry at my house — we just kept eating it for dinner each night until there was nothing left to freeze! The amounts below are for serving 8-12, but the recipe can easily be halved. In a large non-reactive bowl, combine the dry ingredients, garlic-ginger paste, lemon juice, and yoghurt. Mix well to a medium-thick beautifully orange paste. Add a tablespoon or two of water if extremely thick. Add the chicken and stir to thoroughly coat meat. Allow to marinate for at least an hour, but four to six in the fridge is better — longer will increase flavor and tenderness. Prepare grill for cooking chicken. Charcoal will impart unbelievable flavor, but a gas grill is just fine (tip: oil your grates with tongs and paper towel). Heat half a stick of butter in a large stew pot and diced onion until caramelized — watch the butter so that it does not burn. While the onions caramelize, removed chicken from marinade. Use a spoon to scrape off excess marinade, but the meat should remain coated in heavenly flavorful marinade. Reserve the marinade. Start grilling the chicken on medium heat. You can lay meat strait on the grill or skewer as kebabs. When the onions start to turn golden brown, add the garlic-ginger paste, and garam masala. Cook 2-3 minutes until fragrant. Bask in the glory of Indian aromas… this is living right. Add the asafetida. 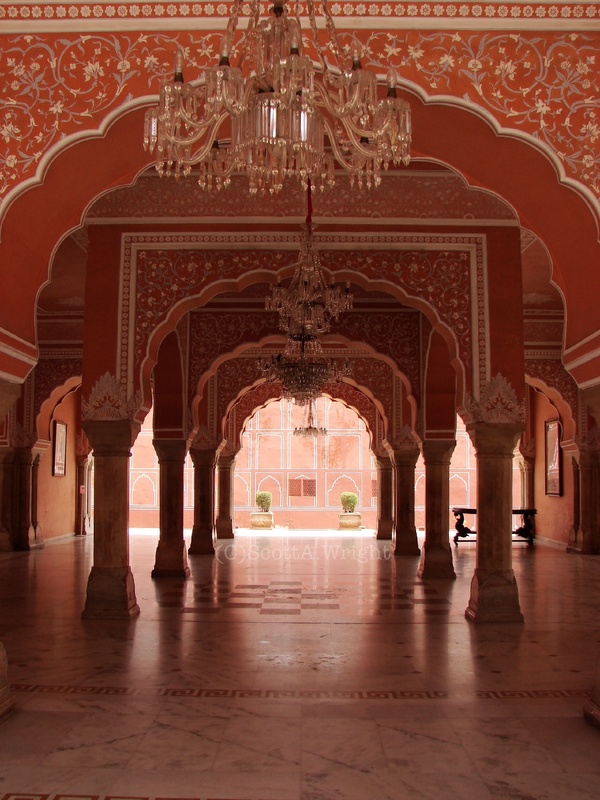 City Palace of the Pink City, Jaipur, Rajasthan. Add the diced tomatoes and bring to a simmer. Many chefs pure’ the tomatoes first, but I skip this step and used finely diced tomatoes. Check your chicken — when grilled to a golden brown, flip or rotate your skewers. Add the reserved marinade, cream, remaining butter, and bring to a simmer, then add the cashew paste, cayenne, salt. Simmer and reduce to the consistency you want, but a medium thick sauce is what is usually found. Remove chicken from grill when fully roasted (cook to 165º F.) and beautifully brown. Allow to rest while the sauce (masala) simmers and reduces. Cut the chicken into bite-sized pieces, add to the sauce. While the chicken simmers in sauce, heat a small, dry skillet and toast the fenugreek seeds until fragrant — a minute or two. Add to sauce. This is an extra step that will dramatically add to the flavor of your dish — allowing the scent of the oils in the spices to bloom with roasting is like catching a whiff of heaven. Taste your divine creation, and add cayenne and salt — adjust to suit your taste. 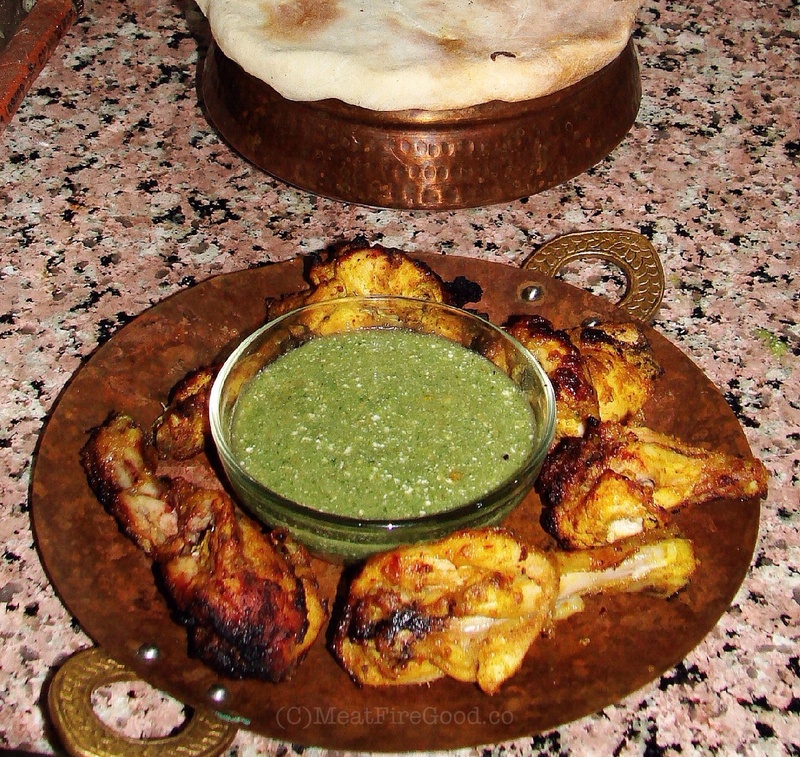 Fire-roasted Butter Chicken served with a cilantro-lime chutney. presentation by serving with a dusting of paprika and freshly chopped cilantro — a fantastic flavor complement. A bed of aromatic basmati rice is a wonderful way to serve an individual portion, but a bowl filled with flavorful chicken and its creamy masala is so satisfying. I like to sprinkle lightly with curry leaf — a lovely flavor that does not add heat. A cilantro chutney for dipping roasted meat is an entirely different approach that gives a new life to this wonderful dish. If presenting a decorative serving dish to a table, a light drizzle of white cream topped with diced peppers and chopped cilantro makes for a visual feast. Regardless of your choice of presentation, I hope you try this dish. It is so very worth the effort. Your friends and family will find it hypnotic. Enjoy. Namaste. This entry was posted in Chicken, Indian and tagged Butter, chicken, Delhi, dinner, food, grilled, India, Indian, Jaipur, Jaipur Cooking Classes, Murgh Makhani, Rajasthan, travel. Bookmark the permalink.